Unfortunately, due to unforeseen circumstances involving bush fires and an evacuation in the early hours of Thursday morning, we were unable to produce a preview for Stage 7. However, we are back with Stage 8. After the euphoria for Team Sky after Edvald Boasson Hagen won the team’s first ever stage on the Tour de France, Stage 7 saw the complete opposite emotions as Bradley Wiggins was involved in a large crash around 40km from the end of the stage. After several minutes of treatment, he was unable to continue with what was later confirmed as a broken collarbone. 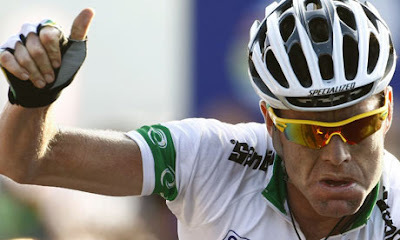 In the end, Mark Cavendish won his second stage in the space of three days, holding off the challenge from the previously invisible Alessandro Petacchi and the German, Andre Greipel. However, a whole host of riders who might have fancied their chances at a push for the top ten were held up in the incident, including the likes of Geraint Thomas, Rigoberto Uran and Roman Kreuziger. Stage 8 is the first hilly stage of the Tour de France and will see the leading GC contenders moving up the rankings with the sprinters sliding back down into the lower positions. The stage sees the peloton heading through the Massif Central, departing from Aigurande and finishing at Super-Besse, a stage finish on three previous occasions. 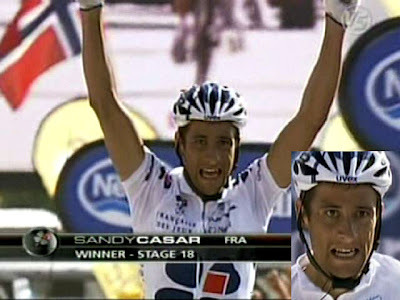 It was the finish of a stage back in 2008, when Riccardo Ricco won, although he was to fail a drugs test only days later. However, Cadel Evans finished third in the stage and will begin as one of the favourites once again (best price of 11/2 with Bwin). He will be the favourite to be wearing the yellow jersey come the end of the stage, since he currently stands only 1 second behind Hushovd, who has himself admitted that it is almost certainly his last day in the jersey. All the big favourites are well up there in the betting with Alberto Contador a best price of 6/1 with William Hill, Andy Schleck a best price of 40/1 with Sporting Bet, Frank Schleck at 28/1 with Sporting Bet and Jurgen van den Broeck at 33/1 with Boyle Sports. However, it needs to be questioned whether any of the big names will want to be wearing the yellow jersey at this stage of the race. Wearing the leader’s jersey brings with it a need to work hard and defend the jersey, putting more pressure on the team in these earlier stages. Garmin Cervelo will not attempt to chase down any breakaway as Thor Hushovd has no real prospect of remaining in yellow. Philippe Gilbert may be high up in the ranking at this stage, but he is unlikely to really be challenging come the end of the race, so it seems quite unlikely that Omega Pharma Lotto will make much of an effort. Similarly, none of Leopard Trek, Saxo Bank or BMC are likely to want their man in yellow at the end of the stage really. Therefore, there is a decent argument that this might be the first stage this year where a breakaway is allowed to stay away and claim the stage win. If this is the case, there are several names who might fancy their chances. Johnny Hoogerland (best price of 66/1 with Stan James) currently owns the polka dot jersey for the best climber and will want to hang onto this jersey. With two category 4 climbs, a category 3 and a category 2 climb at the Croix Saint-Robert, there will be plenty of points on offer. Frenchmen are always keen to get in a breakaway, especially one that has a chance of winning. Combined with the opportunity for some serious mountain points, it would be no surprise to see some of the perennial KOTM contenders up there. Some of the names that may be making an attempt might include David Moncoutie, Jerome Pineau, John Gadret and Sandy Casar. None of them are likely to be a serious threat to any of the GC contenders, so they may allow one of them to take the yellow jersey. One or two other outsider names that might be in a breakaway could include Euskatel’s Egoi Martinez, the Dane, Chris Anke Sorensen or the Portuguese rider, Sergio Paulinho. Whilst there is a decent chance that one of the leading contenders may want to go for the win, there is a big enough chance that a breakaway might succeed that it makes it worthwhile looking for a big odds winner on this stage.